NBC star reflects on six seasons of making the supernatural show. 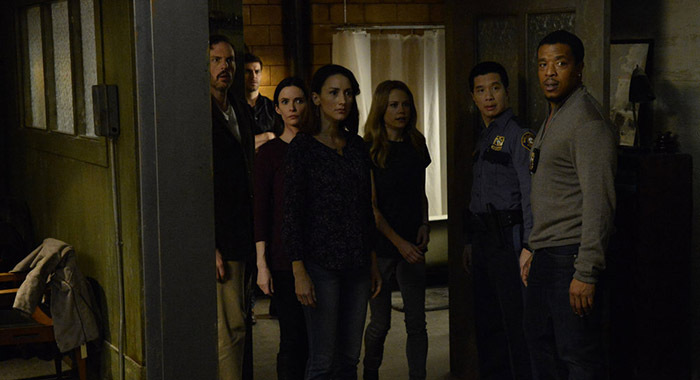 For six seasons, wild and weird NBC show Grimm has taken the idea of Brothers Grimm fairy tales and skewed it in marvelous ways. But now Nick Burkhardt and the gang are hanging up their hunting gear, and the series will come to an end March 31. 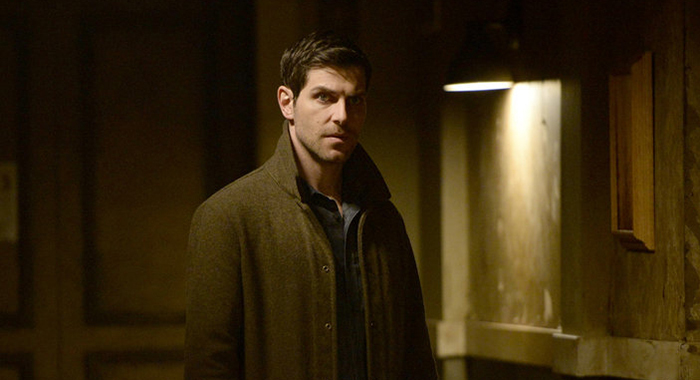 In the series, David Giuntoli plays the Portland, Oregon–based homicide detective, who discovers his ancestry goes way deeper than just your average human; he is a Grimm, a descendant of hunters who fight evil supernatural forces roaming Earth called Wesens. These Wesens — Hexenbiests (witches), Fuchsbaus (foxes), Schakels (jackals), and on — appear to be human, but can “woge” into their creature state at any point. As a police officer, Nick works closely with partner and friend Hank Griffin (Russell Hornsby) and Sgt. 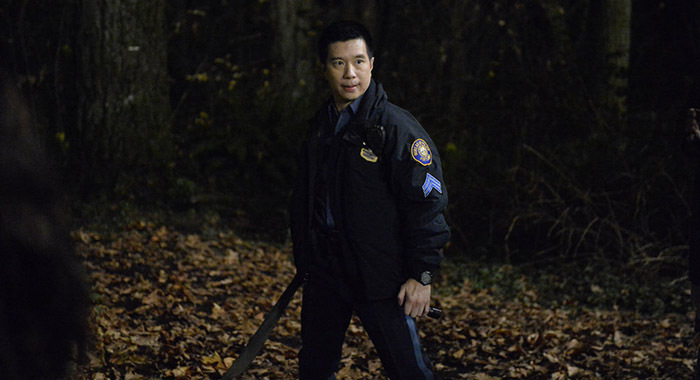 Wu (Reggie Lee), while also trying to keep the bad Wesens at bay with the help of a gentle, wolf-like Wesen named Monroe (Silas Weir Mitchell). 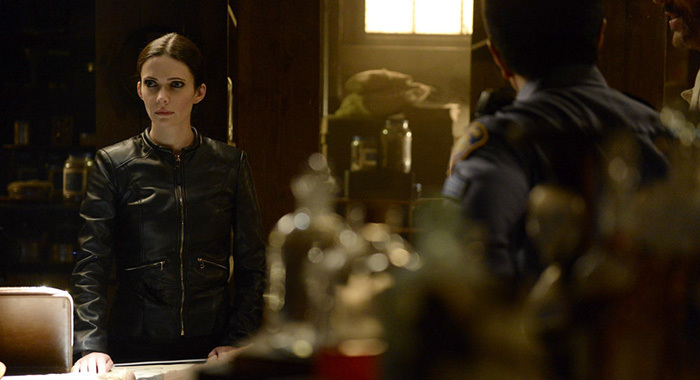 In season 1, Nick attempts to keep his secret from his girlfriend, Juliette (Elizabeth Tulloch), an effort that eventually unravels spectacularly. Rotten Tomatoes spoke with Giuntoli about his experience, what the fans have meant to him, finding love with co-star Elizabeth Tulloch, and what item he took from set. Kit Bowen for Rotten Tomatoes: When you first took the role, did you ever think it would be such a journey? 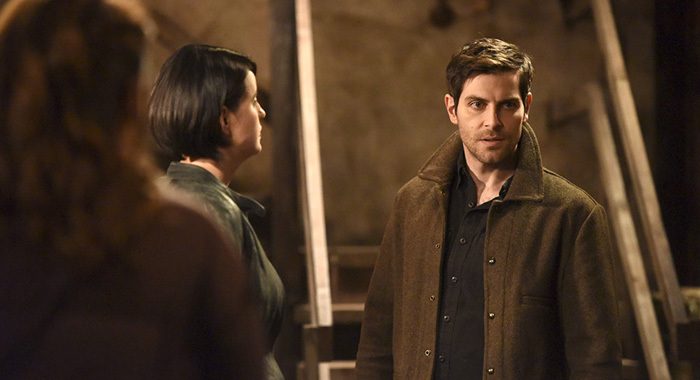 David Giuntoli: I wasn’t looking that far down the road. You’re just kind of doing the gig. It doesn’t behoove an actor to plan about anything. You learn how to let things go very quickly, because no matter how good the project is, you know there’s a hundred reasons for things to fall apart. So I was like, “OK, here’s the pilot. OK, we’ve got 13, that’s great.” I remember where I was when I booked the pilot. I remember where I was I found out we got picked up. I remember where I was when I found out we got a back nine. And after that, it’s all a blur. I’m working till it ends. I’m not going to look around. So, no way! I still can’t believe it. RT: After reading that first script, which must have been a pretty wild read, what was your initial reaction? Giuntoli: It’s a strange show, for sure. You know, you’re in pilot season — and back then, I was a young, in-demand kid [laughs], so I was reading so many things. I remember the first thing I thought about this was, “Oh, this will totally get picked up.” I thought that because I was reading so many medical dramas, so many of those. It was also NBC and at that time, NBC was in the dumps. I thought this is a weird, very strange show, unlike anything else. I knew about these genre shows finding an audience, and thought, “NBC is going to pick this up.” I was pretty sure of myself. 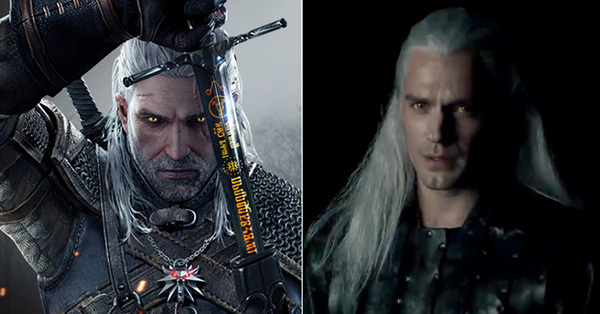 I mean, it was just unlike anything I’d seen before. In a sea of pilots that people are reading and networks have to decide on, this was — I don’t think they knew what the hell it was, but it was unlike anything else. 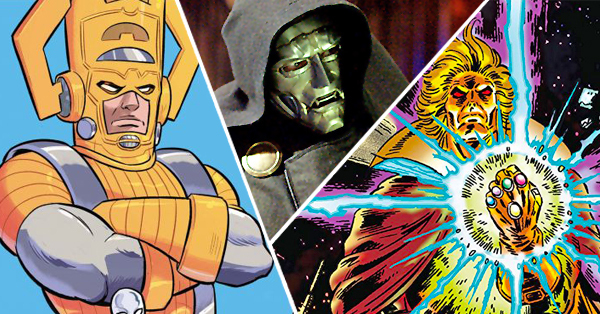 Thank goodness Bob Greenblatt picked this thing up and stuck with it. RT: The Grimm fans are sure happy, too. What was a memorable moment you had with a fan? Giuntoli: One of my favorites is, I was on the ninth floor of the apartment building in Portland, Oregon, where I was living. It’s not easy to get where I live. I was just sitting there reading a script one day, when I heard this, like a paper wrinkling sound, a sliding sound. I’m like, “What the hell was that?” And I look around and see under my door, and there’s a folded piece of paper. What the hell is this? Did I piss off a neighbor? I open it up and it just said, “Big fan.” It was like terrifying and lovely, at the same time. RT: Out of all the craziness on the show, is there a particular moment that sticks out for you? 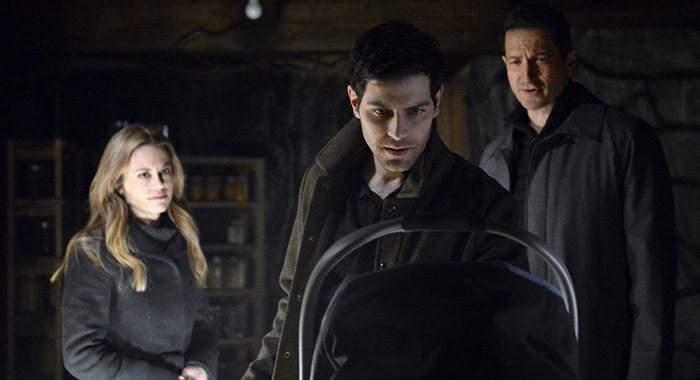 Giuntoli: I think once we started morphing people into other people on the show… I remember one time, there was a shot of Bitsie [Tulloch], who was playing Juliette, who did a potion and morphed into Adalind [played by Claire Coffee]. I just remember thinking, “This is crazy. We’re going into a new direction now.” It was wonderfully shot and the CGI worked nicely, but it was bizarre. Truly bizarre. Also, the first time I saw a guy in full prosthetics, smoking a cigarette on break — a wolf creature having a cigarette on his lunch break — it was very Hollywood moment. RT: Did you get to keep anything from the set? Giuntoli: Oh my god, of course I did! I bought Nick Burkhardt’s Land Cruiser. Yes, I did. Terrible use of money? Probably, but a great memento. 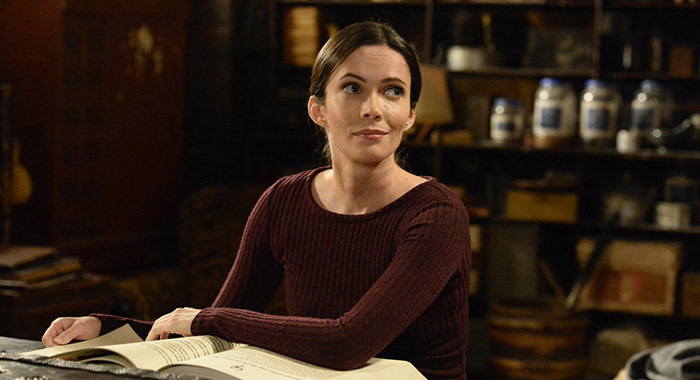 RT: The onscreen relationship between you and Elizabeth Tulloch — first as Juliette, then as Eve — was so compelling. How was it working with her? Giuntoli: Well, here’s a tidbit: We are getting married! Giuntoli: Thank you so much! We aren’t too loud about it, but we are aren’t hiding it — [we] just don’t broadcast it. I’m a lucky guy. I got the good end of that deal. 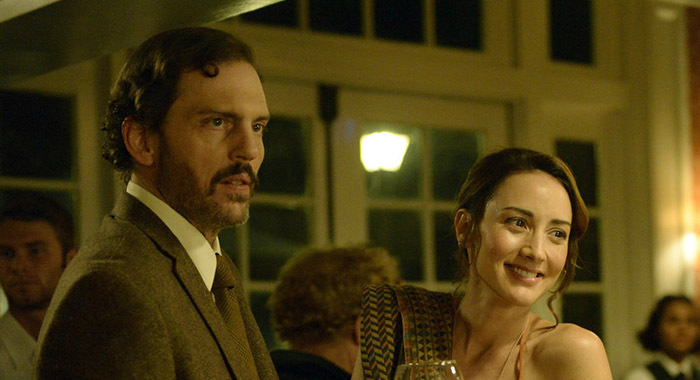 Funny thing: Bitsie and I played boyfriend and girlfriend in a movie prior to Grimm [the 2012 indie Caroline and Jackie]. And her ex-boyfriend directed it. In that movie, I propose to her, and she says no. Three years later — and a couple of relationships later — we are on Grimm together. I proposed to her on Grimm, and she says no again. So two strikes in fantasy world and rocked it in real life. RT: I also love Reggie Lee as Sgt. Wu. He’s one of my favorites on the show, and he gets some of the best lines. Was he a cut-up on set? Giuntoli: He’s certainly a crack-up in life, but on set, he was truly one of the most professional people I know. He would be more or less in character on set and really focused. As you know, it’s hard to stay focused on set, people talking, but he’d stay off in a corner to himself, never rude, but it was really about the performance to him. As it should be. But in life, he’s a crack up and always the sweetest person. But my god, what a great actor. Let me tell you, 123 episodes — you can phone it in if you want to, [but] he never ever phoned it in. For example, he spent two and a half hours getting ready for a scene in which he was walking down a hallway — with no lines. Giuntoli: Yeah, get ready for more of that. RT: What can we expect for the series finale? And more importantly, will the fans be happy with it? Giuntoli: I would say we owe everything to our fans. Not only do we owe everything to them — and I can speak for the other cast mates as well — we also owe the best times we’ve ever had on a show when we get to meet our fans. Otherwise, you’re shooting a show in a warehouse in Portland, near a river. You sometimes forget it’s for people, so it’s so nice when you get to meet them. I’ll say I think the writers did a wonderful job ending it. Grimm was this weird fairy tale that wasn’t a fairy tale, and we gave them a fairy-tale ending that’s not a fairy-tale ending. But it’s definitely an ending, there’s no ambiguity. RT: Describe the emotions on the set that final day of taping. Giuntoli: We film in Oregon, and it was a death to a TV show befitting of the Oregon hospice care laws. We knew we were getting a final season, so there was no ambiguity there. We had that entire last year to grieve and prepare ourselves for the loss and also the next steps. We had wrapped a couple of our cast members a little early [you’ll find out who on March 24]. On that final day… it was very sad and touching — tears and a lot of love there. It was beautiful, and we’ve seen each other since then already. We refuse to stop partying together. 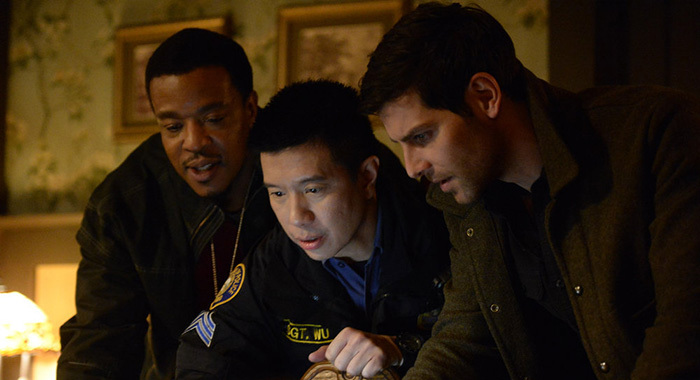 RT: If there’s one thing you’d like to say to all the Grimmsters out there, what would it be? Giuntoli: I would like to say thank you. You’ve made me very fulfilled person — and a spoiled rotten actor. If you want to keep paying me, you can send money orders to my P.O. box. 2015 Summer Thanksgiving First Look Writers Guild of America Kids & Family mutant DirecTV CBS Captain marvel BET Comics on TV facebook Lucasfilm Rock FXX Brie Larson FOX Paramount Amazon Lionsgate Esquire Countdown what to watch serial killer elevated horror biography Fox News Mary Poppins Returns Marvel TNT IFC Films History cats TCM Acorn TV spy thriller adventure Certified Fresh Stephen King OWN Christmas Drama Polls and Games Ovation TV Land Pop Sundance Grammys Sneak Peek DC Universe Rom-Com Unbreakable Kimmy Schmidt E! Super Bowl romance Red Carpet Mudbound teaser Spike Set visit Amazon Prime social media Mystery Shondaland Song of Ice and Fire aliens TCA Comedy police drama psychological thriller Tumblr Columbia Pictures HBO ABC Family singing competition YouTube Red Calendar Showtime politics Dark Horse Comics jamie lee curtis justice league Reality Competition anime Interview dc Spring TV dragons 45 WGN GLAAD Premiere Dates television MSNBC Podcast green book doctor who USA CNN zero dark thirty Animation Logo New York Comic Con war Ghostbusters true crime zombies BBC America supernatural Sci-Fi Lifetime Black Mirror travel dramedy NBC CBS All Access 21st Century Fox Hulu sports Shudder Extras robots Awards Infographic YA PBS Epix miniseries Food Network Marathons cooking dceu comiccon DC streaming service TV Valentine's Day Mary Tyler Moore Superheroe PaleyFest psycho Mary poppins 2019 Syfy TCA 2017 SDCC transformers Freeform Trivia Watching Series vampires GIFs BBC ITV golden globes Pixar Sony Pictures Fall TV Starz Nat Geo Winter TV Oscars based on movie Universal DGA SundanceTV award winner Tomatazos E3 crime drama witnail Schedule Anna Paquin discovery The Arrangement anthology Holidays casting sequel USA Network Mindy Kaling National Geographic diversity Best and Worst Pet Sematary Musicals Pirates Star Trek boxoffice Martial Arts 007 RT21 FX Chilling Adventures of Sabrina VICE MTV RT History President hist San Diego Comic-Con blaxploitation Apple AMC Awards Tour Winners Character Guide crossover adaptation American Society of Cinematographers Masterpiece Paramount Network zombie Box Office binge VH1 Trophy Talk Bravo 20th Century Fox natural history sitcom medical drama 2017 Comic Book TruTV 24 frames Quiz Horror Toys Women's History Month El Rey A&E Comedy Central technology Adult Swim harry potter Music cults cinemax Star Wars Britbox Rocky science fiction theme song Ellie Kemper ratings 2018 Photos mockumentary docudrama Fantasy festivals 2016 Netflix YouTube Premium APB LGBTQ talk show Biopics comic political drama MCU TLC See It Skip It Nickelodeon Sundance Now historical drama IFC CMT ESPN nature ABC Walt Disney Pictures X-Men Cartoon Network Spectrum Originals composers Election CW Seed Musical cops Trailer richard e. Grant Disney Channel thriller crime DC Comics Creative Arts Emmys Action Disney Emmys Country Superheroes GoT Year in Review streaming The CW Western Crackle crime thriller TBS NYCC finale Opinion spider-man Teen Reality TIFF Nominations SXSW period drama Video Games unscripted Cosplay Warner Bros.